The department of Plant Taxonomy was founded on the current site, in front of the greenhouses, as early as in the year 1870. 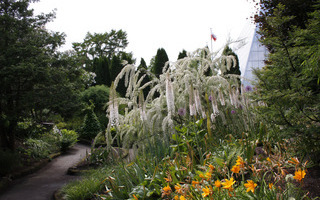 The area for growing monocots was re-designed into a free-shaped one at the beginning of the 1990s. The most rich-in-species groupings comprise the family Liliaceae (genera Tulipa, Allium, Fritillaria, Ornithogalum), the Iris family, the Orchid family, families Gramineae, Cyperaceae, Araceae. There are more than 300 species of monocotyledonous plants growing in the area. The area for dicots has been in the same place since the foundation of the relevant department.A total of 800 natural species grow in this area. The herbaceous perennials constitute the majority of them (more then 60%), but there are also annual plants and those surviving the winter. The Park is located on the top and slopes of the former bastion and covers the biggest area in the Garden. The arboretum contains species of woody plants from different temperate regions of the world. 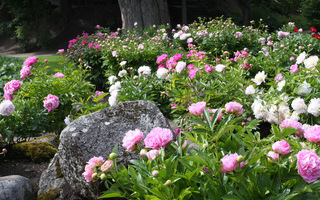 The perennials grow in the department of plant taxonomy, in the rock garden and the arboretum. 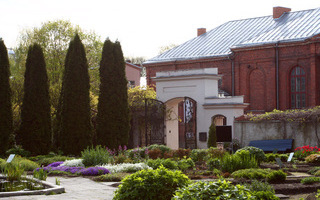 The clematis garden was built in 2006 and is situated right from the entrance from Emajõe St. In this department we present only native cultivars of clematises, by breeders Uno Kivistik and Eino Kala. The annuals collection varies from year to year, but the average number of taxa is 100 every year. 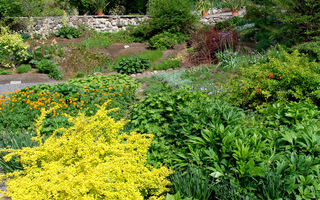 The department of alpine plants is located in the middle of the garden, on the slopes and the valley of the former St. George’s Bastion of the town wall. The plants are selected according to their natural habitats – the upper part of the forest zone of mountainous regions and the alpine zone. 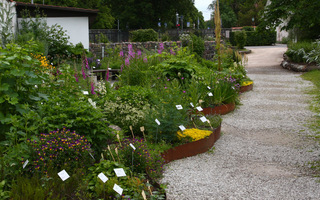 Currently 900 taxa of alpine plants grow in the Rock Garden. 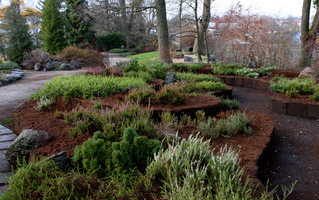 The other part of this department is the talus garden which reaches the shady slope and is also the site of the turf garden. The ascent, moulded from peat loaves is suitable for plants growing in acid soils. 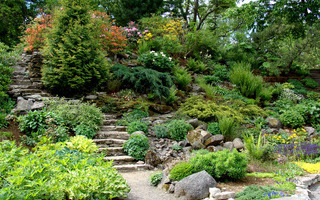 In 2002, a summer stage for concerts, exhibitions and presentations was erected in the northern part of the Rock Garden. is located near the river-side edge. In July, during the blooming time of the roses, the garden offers a pleasant experience with its bright colors and unique world of fragrances. The more than 200-cultivar collection of roses provides an overview of the most important modern variety groupings of cultivated roses, their decorative character and suitability to be grown on an open field. The Department of Estonian Plants is located in the western side of the Botanical Garden, beside the Department of Plant Taxonomy.